International expert and consultant David Maister offers a brilliant and accessible guide to every management issue at play in professional firms. Professional firms differ from other business enterprises in two distinct ways: first, they provide highly customized services and thus cannot apply many of the management principles developed for product-based industries. Second, professional services are highly personalized, involving the skills of individuals. Such firms must therefore compete not only for clients but also for talented professionals. The commonality of this mission does not detract from its value. Simply put, every professional firm must satisfy these three goals of "service, satisfaction, and success" if it is to survive. Management of a professional firm requires a delicate balancing act between the demands of the client marketplace, the realities of the people marketplace (the market for staff), and the firm's economic ambitions. Many factors play a role in bringing these goals into harmony, but one has a preeminent position: the ratio of junior, middle-level, and senior staff in the firm's organization, referred to here as the firm's leverage. To see the importance of this factor, we shall briefly examine, in turn, its relation to the three goals of the firm. The required shape of the organization (the relative mix of juniors, managers, and seniors) is primarily determined by (or rather, as we shall see, should be determined by) the skill requirements of its work: the mix of senior-level, middle-level, and junior-level tasks involved in the projects that the firm undertakes. Consider three kinds of client work: Brains, Grey Hair, and Procedure projects. In the first type (Brains), the client's problem is at the forefront of professional or technical knowledge, or at least is of extreme complexity. The key elements of this type of professional service are creativity, innovation, and the pioneering of new approaches, concepts or techniques: in effect, new solutions to new problems. The firm that targets this market will be attempting to sell its services on the basis of the high professional craft of its staff. In essence, their appeal to their market is, "Hire us because we're smart." Brains projects usually involve highly skilled and highly paid professionals. Few procedures are routinizable: Each project is "one-off." Accordingly, the opportunities for leveraging the top professionals with juniors are relatively limited. Even though such projects may involve significant data collection and analysis activities (normally performed by juniors), even these activities cannot be clearly specified in advance and require the active involvement of at least middle-level (project management) professionals on a continuous basis. Consequently, the ratio of junior time to middle-level and senior time on Brains projects tends to be low. Grey Hair projects, while they may require a highly customized "output" in meeting the clients' needs, involve a lesser degree of innovation and creativity in the actual performance of the work than would a Brains project. The general nature of the problem to be addressed is not unfamiliar, and the activities necessary to complete the project may be similar to those performed on other projects. Clients with Grey Hair problems seek out firms with experience in their particular type of problem. In turn, the firm sells its knowledge, its experience, and its judgment. In effect, they are saying, "Hire us because we have been through this before; we have practice at solving this type of problem." Since for Grey Hair-type projects the problems to be addressed are somewhat more familiar, at least some of the tasks to be performed (particularly the early ones) are known in advance and can be specified and delegated. The opportunity is thus provided to employ more juniors to accomplish these tasks. The third type of project, the Procedure project, usually involves a well-recognized and familiar type of problem. While there is still a need to customize to some degree, the steps necessary to accomplish this are somewhat programmatic. The client may have the ability and resources to perform the work itself, but turns to the professional firm because the firm can perform the service more efficiently, because the firm is an outsider, or because the client's own staff capabilities to perform the activity are somewhat constrained and are better used elsewhere. In essence, the professional firm is selling its procedures, its efficiency, its availability: "Hire us because we know how to do this and can deliver it effectively." Procedure projects usually involve the highest proportion of junior time relative to senior time (and hence imply a different organizational shape for firms that specialize in such projects). The problems to be addressed in such projects, and the steps necessary to complete the analysis, diagnosis, and conclusions are usually so sufficiently well established that they can be easily delegated (under supervision) to junior staff. For Procedure projects the range of possible outcomes for some steps may be so well known that the appropriate responses may be "programmed." The three categories described here are, of course, only points along a spectrum of project types. However, it is usually a simple task in any profession to identify types of problems that fit these categories. The choice that the firm makes in its mix of project types is one of the most important variables it has available to balance the firm. The choice of project types influences significantly, as we shall see, the economic and organizational structures of the firm. Consider what will happen if a firm brings in a mix of client work such that its "proper" staffing requirements would be for a slightly higher mix of juniors, and a lesser mix of seniors than it has (i.e., the work is slightly more procedural than the firm would normally expect). What will happen? As Figure 1-2 suggests, the short-run consequence will be that higher priced people will end up performing lower-value tasks (probably at lower fees), and there will be an underutilization of senior personnel. The firm will make less money than it should be making. The opposite problem is no less real. If a firm brings in work that has skill requirements of a higher percentage of seniors and a lesser percentage of juniors, the consequences will be at least equally adverse: a shortfall of qualified staff to perform the tasks, and a consequent quality risk. As these simple examples show, matching the skills required by the work to the skills available in the firm (i.e., managing the leverage structure) is central to keeping the firm in balance. The connection between a firm's leverage structure (its ratio of junior to senior professional staff) and the people marketplace can be captured in a single sentence: People do not join professional firms for jobs, but for careers. They have strong expectations of progressing through the organization at some pace agreed to (explicitly or implicitly) in advance. The professional service firm may be viewed as the modern embodiment of the medieval craftsman's shop, with its apprentices, journeymen, and master craftsmen. The early years of an individual's association with a professional service firm are, indeed, usually viewed as an apprenticeship, and the relation between juniors and seniors the same: The senior craftsmen repay the hard work and assistance of the juniors by teaching them their craft. The archetypal structure of the professional service firm is an organization containing three professional levels. In a consulting organization, these levels might be labeled junior consultant, manager, and vice president. In a CPA firm they might be referred to as staff, manager, and partner. Law firms tend to have only two levels, associate and partner, although there is an increasing tendency in large law firms to recognize formally what has long been an informal distinction between junior and senior partners. Responsibility for the organization's three primary tasks is allocated to these three levels of the organization: seniors (partners or vice presidents) are responsible for marketing and client relations, managers for the day-to-day supervision and coordination of projects, and juniors for the many technical tasks necessary to complete the study. The three levels are traditionally referred to as "the finders, "the minders," and "the grinders" of the business. The mix of each that the firm requires (i.e., its ratio of senior to junior professionals) is primarily determined by the mix of client work, and in turn crucially determines the career paths that the firm can offer. While the pace of progress may not be a rigid one ("up or out in five years"), both the individual and the organization usually share strong norms about what constitutes a reasonable period of time for each stage of the career path. Individuals who are not promoted within this period will seek greener pastures elsewhere, either by their own choice or career ambitions, or at the strong suggestion of the firm. This promotion system serves an essential screening function for the firm. Not all young professionals hired subsequently develop the managerial and client relations skills required at the higher levels. While good initial recruiting procedures may serve to reduce the degree of screening required through the promotion process, it can rarely eliminate the need for the promotion process to serve this important function. The existence of a "risk of not making it" also serves the firm in that it constitutes a degree of pressure on junior personnel to work hard and succeed. The promotion incentive is directly influenced by two key dimensions: the normal amount of time spent at each level before being considered for promotion, and the "odds of making it" (the proportion promoted). These factors are clearly linked to a firm's leverage structure (and its growth). For any given rate of growth, a highly leveraged firm (one with a high ratio of juniors to seniors) will offer a lower probability of "making it" to the top, since there are many juniors seeking to rise and relatively few senior slots opening up. A less leveraged firm, at the same rate of growth, will need to "bring along" a higher percentage of its juniors, thus providing a greater promotion incentive. A professional service firm's leverage is also central to its economics. The "rewards of partnership" (the high levels of compensation attained by senior partners) come only in part from the high hourly (or daily) rates that the top professionals can charge for their own time. Profits also come, in large part, from the firm's ability, through its project team structure, to leverage the professional skills of the seniors with the efforts of juniors. The successful leveraging of top professionals is at the heart of the success of the professional firm. As demonstrated below, a significant portion of partnership profits derives from the surplus generated from hiring staff at a given salary and billing them out at multiples of that salary. By leveraging its high-cost seniors with low-cost juniors, the professional firm can lower its effective hourly rate and thus reduce its cost to clients while simultaneously generating additional profit for the partners. The market for the firm's services will determine the fees it can command for a given project; its costs will be determined by the firm's abilities to deliver the service with a cost-effective mix of junior, manager, and senior time. If the firm can find a way to deliver its services with a higher proportion of juniors to seniors, it will be able to achieve lower service delivery costs. The project team structure of the firm is therefore an important component of firm profitability. The relationship between a firm's leverage structure and its three goals is illustrated in Figure 1-4, which shows the principal forces tying these elements together. To explore further how these items interrelate, let us consider a numerical example. Guru Associates, which engages in a variety of projects, nevertheless has a typical project which requires 50 percent of a senior's time, 100 percent of a middle-level person's time, and the full-time efforts of three juniors. No one is expected to bill 100 percent of each's available time. Nevertheless, if the firm is to meet its economic goals, it will require that seniors and managers are engaged in billable work for 75 percent of their time, and juniors 90 percent. Guru Associates currently has four seniors. If it is to meet its target of 75 percent billed senior time, its available senior time will be four times 75 percent, or the equivalent of three seniors working full-time. This implies six projects, if the typical project requires 50 percent of a senior's time. With six projects, the firm needs the equivalent of six full-time middle-level staff, according to the project team structure. (Each project requires 100 percent of a middle-level person). At 75 percent target utilization (billed hours divided by available hours), this means that the firm must have eight middle-level staff. Similarly, at three juniors per project, the firm needs eighteen full-time juniors, or at 90 percent billability, twenty juniors. Simple calculations such as these show that, with eight seniors, the firm would need sixteen managers and forty juniors. The proportions remain constant: one senior to every two managers, to every five juniors. Unless there is a change in either the project team structure (i.e., the types of projects the firm undertakes), or the target utilization (matters which will be discussed below), the firm must keep these ratios constant as it grows. This seemingly simpleminded calculation, relating the staffing mix requirements of the work to the staffing levels existing in the firm, is in fact of extreme importance. If we know the salaries of the staff members and their billing rates, we can construct the pro forma income statement of this firm at full utilization. The role of leverage is amply illustrated by Guru Associates. The four seniors (partners) personally bill a total of $1.2 million, or $300,000 apiece. At per-professional overhead costs of $40,000 (including the costs of all secretaries, administrative staff, space, supplies, etc. ), this would result in a per-partner profit of $260,000 if these seniors were totally unleveraged. With a healthy seven staff members per senior, partner profits now total $420,000 apiece. About 60 percent of each partner's profit comes not from what he or she bills, but from the profit generated by the nonpartner group. Thus the benefits of leverage! (It should be immediately stressed that high leverage is not always good. As we have already observed, having high leverage is completely inappropriate if the firm has a high level of Brains work. What we can say is that leverage should be as high as the requirements of the work allow). We now turn to Guru Associates' position in the market for staff. Guru Associates has the following promotion policies. It considers that it requires four years for a junior to acquire the expertise and experience to perform the middle-level function, and it expects to promote 80 percent of its candidates to this position. A lower percentage would be insufficient to attract new juniors, and a higher percentage would imply that insufficient "screening" was taking place (i.e., that there was no room for "hiring mistakes"). From middle-level to senior is also expected to take four years; but because fewer candidates develop the critical client relations skills that Guru Associates requires, on average only 50 percent of candidates make it. Counting both those promoted and those leaving we have reduced the number of middle-level staff by two; and increased the number of seniors by one. Since we now have five seniors, we require ten middle-level staff (unless the mix of project types changes) and have six remaining. We must seek out four new middle-level staff from among our juniors. Of the twenty in the firm, we assume one quarter (five) will be in their final year as juniors. Since our expectation (or policy) is to promote 80 percent at this level, we will, indeed, promote four out of the five to fill our four available slots. (The fact that these figures match is not, of course, fortuitous. The percentage that can be promoted at a lower level is determined by the shape of the professional pyramid.) Like the "passed over" middle-level staff person, the fifth junior may reasonably be assumed to leave the firm. We now have fifteen juniors left. However, with five seniors, and ten managers, the firm requires twenty-five juniors: it must hire ten. These changes are summarized in Table 1-3, which follows the same logic for years 1 through 9. In year 5, the first batch of middle-level staff that were promoted from junior in year 1 will be ready to be considered for promotion to senior. It will be recalled that there are four of them. If promotion opportunities are to be maintained, then two will be promoted (i.e., 50 percent) and two will leave. This creates a total of ten seniors. With a total of ten seniors in year 5, twenty middle-level staff are required. Of the sixteen in the firm the previous year, four have been promoted or have left, meaning that a total of eight juniors must be promoted. Fortunately (but not fortuitously) ten juniors who were hired in year 1 are to be considered for promotion. The expected 80 percent target may be maintained! What must be stressed at this point is that we have arrived at these staffing levels solely by considering the interaction of the firm's leverage structure with the promotion incentives (career opportunities) that the firm promises. What we have discovered by performing these calculations is that the interaction of these two forces determines a target (or required) growth rate for the firm. As Table 1-3 shows, Guru Associates must double in size every four years solely to preserve its promotion incentives. If it grows at a lower rate than this, then either it will remove much of the incentive in the firm, or it will end up with an "unbalanced factory" (too many seniors and not enough juniors) with a consequent deleterious effect upon the firm's economics. If the firm attempts to grow faster than target rate, it will be placed in the position of either having to promote a higher proportion of juniors, or to promote them in a shorter period of time. Without corresponding adjustments, this could have a significant impact on the quality of services that the firm provides. We have seen that the leverage structure and the promotion policies together determine a target (required) growth rate. It should be acknowledged, however, that there is another way of looking at the relationship between these variables. An equivalent way of stating the relationship would be to observe that if given a growth rate and a leverage structure, the promotion incentives that result can be specified. We may see this by examining Table 1-3 once more. Suppose that we had constructed this by specifying the growth rate and the project team structure. We would then have discovered that we could afford to promote only four out of five juniors and one out of two managers. We would also have discovered that we would have a "built-in," or target, turnover rate averaging over 4 percent (two resignations per year for the first four years while the average number of nonsenior staff was 45.5). In most professions, one or more firms can be identified that have clearly chosen a high target rate of turnover. Partners (or shareholders) can routinely earn a surplus value from the juniors without having to "repay" them in the form of promotion. This high turnover rate also allows a significant degree of screening so that only the "best" stay in the organization. Not surprisingly, firms following this strategy tend to be among the most prestigious in their industry. This last comment gives us the clue as to why such firms are able to maintain this strategy over time. Individuals continue to join these organizations, knowing that the odds of "making it" are very low. In the eyes of many potential recruits, the experience, training, and association with the prestigious firms in the industry make the poor promotion opportunities at such firms worthwhile. Young professionals view a short period of time at such firms as a form of "post-postgraduate" degree, and often leave for prime positions they could not have achieved as quickly by another route. Indeed, most of the prestige firms following this strategy not only encourage this but provide active "outplacement" assistance. Apart from the beneficial effects that such activities provide in recruiting the next generation of juniors, such alumni are often the source of future business for the firm when they recommend to their corporate employers hiring their old firm (which they know and understand) over other competitors. Before we leave the topic of growth, we should take a quick peek back at Guru Associates. How did its growth contribute to its profitability? Let us perform our analysis on the basis of constant (year 0) dollars, to remove the effect of inflation. By implication, this means that the salaries and billing rates at each staff level remain the same. What does the firms' profit and loss statement now look like? Table 1-4 repeats the analysis of Table 1-2, using year 5 staffing levels instead of year 0. The result? Per-partner profits have not increased! In fact, they have remained precisely the same! What this simple example shows is that there is no necessary relationship between growth and profits. As we have seen, growth in a professional firm is driven primarily by the need to attract and retain staff, and is critical for that reason, but is not a guarantee of higher per-partner profits. Why is this so? We shall explore the reasoning in greater detail in subsequent chapters, but the basic fact is this. If a firm grows subject to two conditions, as Guru Associates has, whereby: (a) the mix of client projects (and hence fee levels) remains the same; and (b) the project staffing (or leverage) is such that the same proportion of senior or partner time is required to handle each project; then the number of seniors or partners that the firm requires will correspond exactly to the growth rate. In consequence of this, the profit pool may increase because of the higher volume, but it must be shared among a correspondingly increased number of partners. If per-partner profits are to increase, then one of the two conditions must be broken. Either the firm must bring in a different mix of business commanding higher billing rates (i.e., find higher-value work for its people to do), or it must find ways to serve the same kinds of work with an ever increasing proportion of junior time, and a declining proportion of senior time. It is interesting to note that few prominent professional firms act as if growth were profit neutral. Indeed, rapid growth is often listed as a primary goal of the firm, and advances in top-line growth are used as a primary internal and external measure of success. If justified in the name of providing career opportunities for staff, this indeed makes sense. However, if desired on profitability grounds, it would appear that many professional firms are fooling themselves! Perhaps the most significant management variable to be disclosed by the previous analysis is the choice of the mix of projects undertaken, and the implications this has for the (average) project team (i.e., leverage) structure. As we have seen, this latter variable is a significant force in influencing the economics of the firm, its organizational structure, and its positioning in the client and people markets. The leverage structure, in the sense used in this book -- as the average or typical proportion of time required from professionals at different levels -- has not been a variable that is routinely monitored by firm management. However, as we have shown, its role in balancing the firm is critical. It is possible, and not uncommon, for the firm's project team structure to change over time. If it is possible to deliver the firm's services with a greater proportion of juniors, this will in general reduce the costs of the project. Competition in the market for the firm's services will, over time, require the firm to seek out lower costs for projects of a particular type, and there will often be opportunities for an increasing proportion of juniors to be used on projects that, in the past, required a high proportion of senior time. What in past years had the characteristics of a Brains or Grey Hair project may, in future years, be accomplishable as a Procedure project. When considering new projects to undertake, it is usually more profitable for the firm to engage in one similar to that recently performed for a previous client. The knowledge, expertise, and basic approaches to the problem that have already been developed (often through a significant personal and financial investment) can be capitalized upon by bringing them to bear on a similar or related problem. Frequently the second project can be billed out to the client at a similar (or only slightly lower) cost, since the client perceives (and receives) something equally custom-tailored: the solution to his problem. However, the savings in costs incurred by the firm in delivering this customization are not all shared with the client (if, indeed, any are). The firm thus makes its most money by "leading the market": being able to sell as a fully customized service (at a fully customized price) what increasingly becomes a service with reproducible, standardized elements. While it is in the best interests of the firm that similar or repetitive engagements be undertaken, this is often not in accord with the desires of the individuals involved. Most individuals that join professional firms do so out of the desire for professional challenge and variety and the avoidance of routine and repetition. While they may be content to undertake a similar project for the second or third time, they will not be for the fourth or sixth or eighth. The solution, of course, is to convert the past experience and expertise of the individual into the expertise of the firm by accepting the similar project, but utilizing a greater proportion of juniors on second- or third-time projects. Apart from requiring a lesser commitment of time from the experienced seniors, this device serves the admirable purpose of training the juniors. For all these reasons, we might suspect that, over time, the proportion of juniors to seniors required by the firm in a particular practice area will tend to increase. If this is allowed to proceed without corresponding adjustments in the range of practice areas, the basic project team structure of the firm will alter, with significant impacts on the economics and organization of the firm. The dangers of failing to monitor the project team structure are thus clearly revealed. An investment banking firm discovered that, over a period of years, it had so increased the range of analyses and services it provided in advising its clients that it, too, needed more juniors on each project. Successfully integrating this new project team structure required major changes in all of the firm's administrative procedures, particularly its human resource and professional development activities. For these firms, as for all professional service firms, successful management became a question of balance. Frederic W. Gluck former managing director, McKinsey & Company Important reading -- not just for managing partners, but for new associates. Tom Peters author/co-author of In Search of Excellence, Thriving on Chaos, and Liberation Management The professional service firm is the best model for tomorrow's organization in any industry. When it comes to understanding these firms, David Maister has no peers. 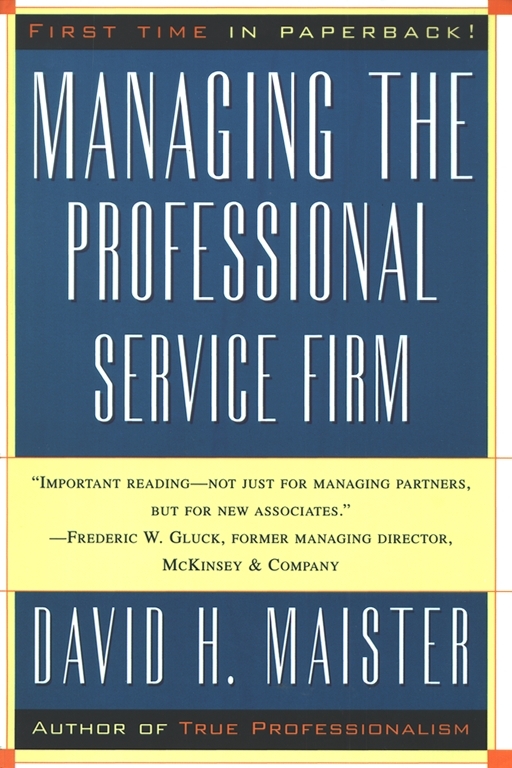 James L. Heskett Professor, Harvard Business School; co-author of Service Breakthroughs David Maister's name is synonymous with the latest thinking in professional service firm management. This book suggests why.